For the past few weeks, I’ve been hearing talk of summer being over, presumably because of school starting back up in many places. Being neither in school, nor knowing many people who are, the notion of summer being over in mid-August perplexes me. Summer break may have ended, but the season itself doesn’t officially finish until September 21st, and it doesn’t even unofficially end until next Tuesday, post Labor Day. Here in San Francisco, most of our summer looks like this at 2:24. For me, summer just began last Tuesday. San Francisco farmer’s markets and I have a rocky past, so when my friend Lea invited me to join her in Berkeley at her local market, I jumped at the chance. “It’s pretty small,” she warned. But compared to San Francisco’s markets, this one was palatial, taking up two wide blocks, and brimming with dozens of organic farm stands, each more plentiful than the next. I thought I’d died and gone to heaven. There was so much space to walk around, and no one cut in front of me in line or elbowed me out of the way. I even set my germ phobia aside to taste some stone fruit, which was piled high at nearly every stand. We stopped at one stand that had a large crowd gathered around a mountain of Oh Henry peaches. I sniffed one, and it was like summer has exploded in my nose. We waited for a sample and, after slipping slices of dripping, bright orange peach into our mouths, we both grabbed a bag and started loading up. The peaches of late summer are larger and heavier than their June counterparts. 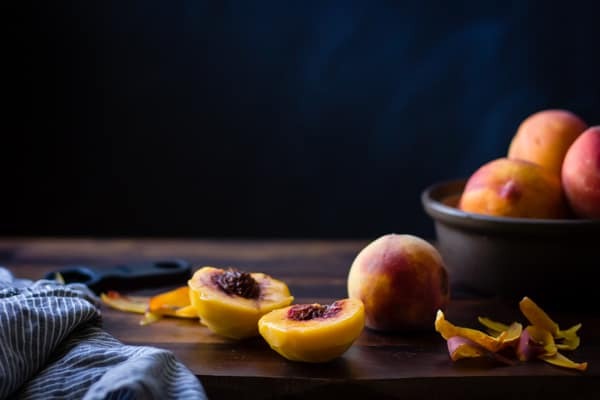 Their flesh is dense, their sweet-tart flavor more robust, making them better for baking than the peaches of early summer that taste soft and floral and seem too precious to squander on a pie. 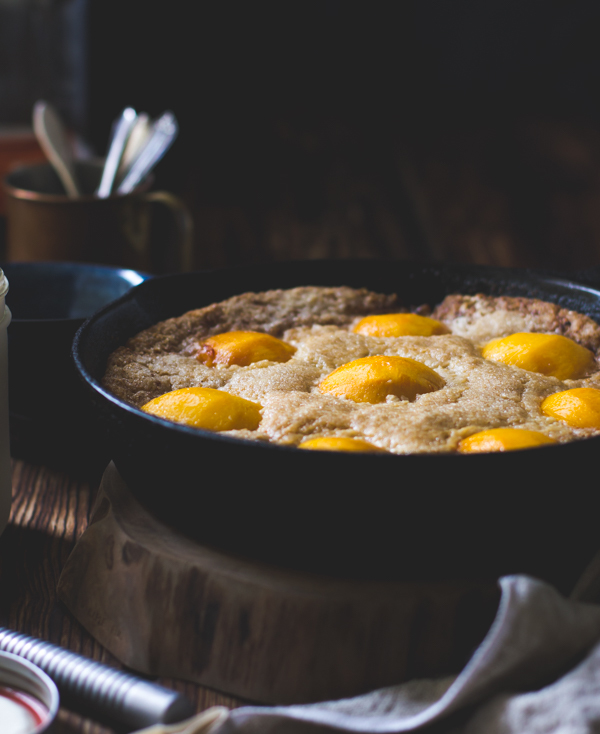 The Oh Henries were destined for this recipe, a Southern-style cobbler discovered and adapted by my friend Amelia. 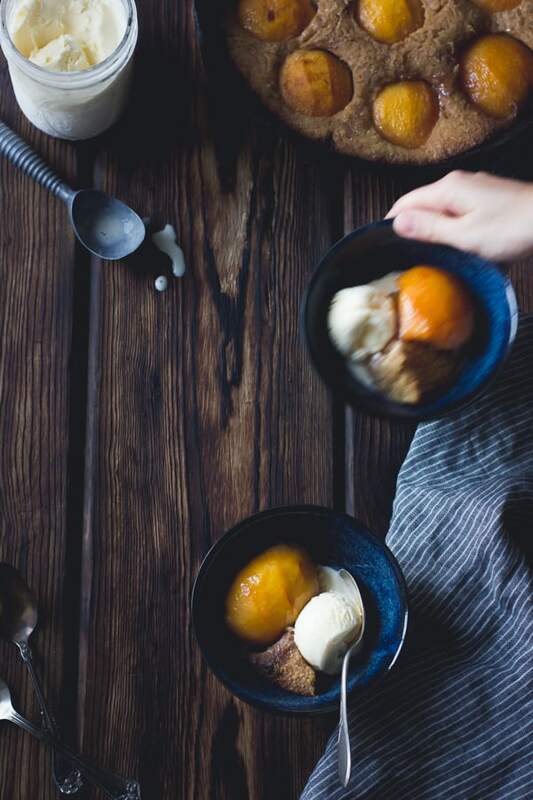 While I normally think of cobblers as sliced fruit topped with biscuits resembling cobblestones, this is the inverse: a custardy cake batter topped with peach halves. I’m having trouble finding definitive information on the different types of cobblers, but this version seems to have its roots in the South. Either way, it is quite delicious, and easy to make. 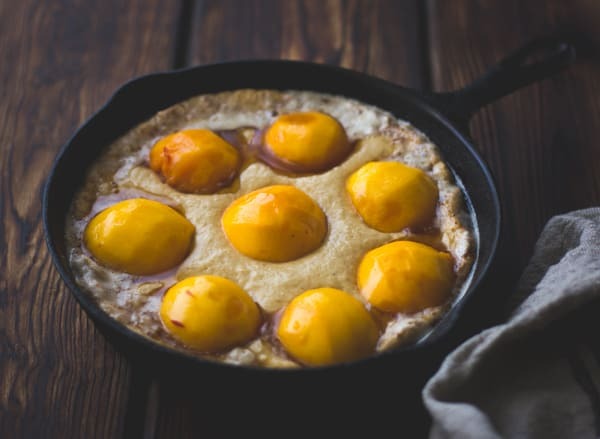 Butter is browned in a skillet, then topped with a loose batter made from flour, sugar and milk. 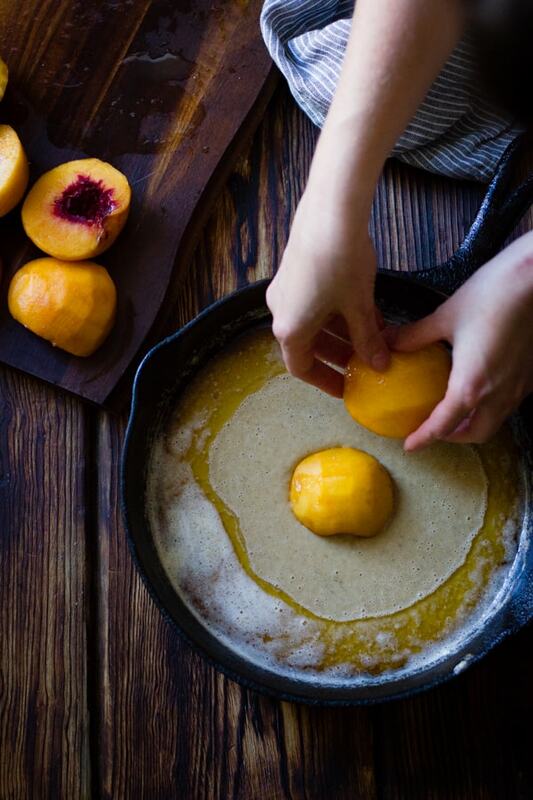 The batter is usually poured over peach slices, but Amelia puts the batter in the hot pan first, then tops it with peach halves the way her aunt used to make it when Amelia was little. The batter puffs up around the fruit, soaking in the golden butter as it bakes. I added a vanilla bean to the browning butter, which made me think of maple sugar and nutmeg, so I added those to the batter. 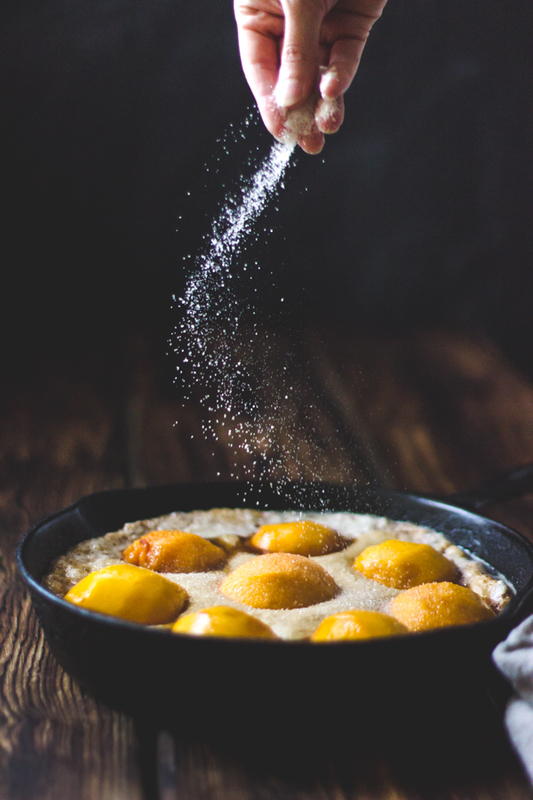 When Amelia and I tasted the final result, we both thought “bourbon!,” so we sprinkled some over the baked cobbler, which added a bit of boozy tartness. The dessert comes out like a pudding cake of sorts, gooey and warm, with addictively crispy edges. 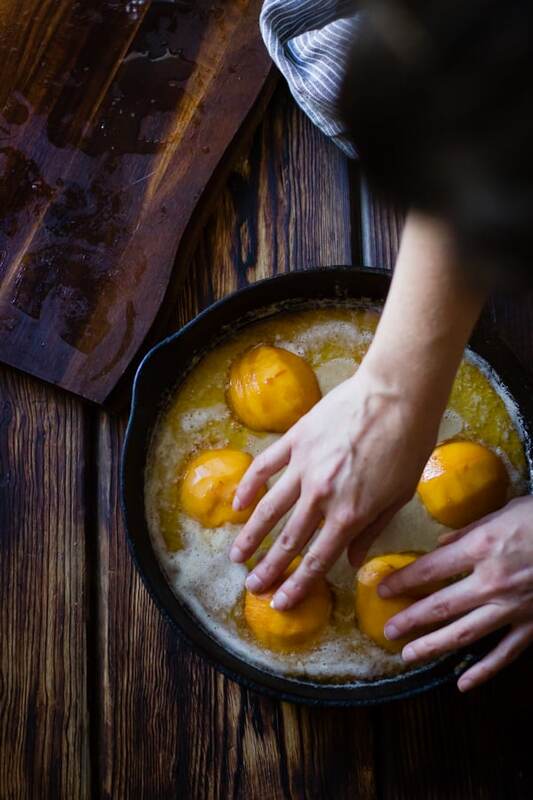 The peaches soften a bit, holding their shape in perfect little orbs, tender and juicy. 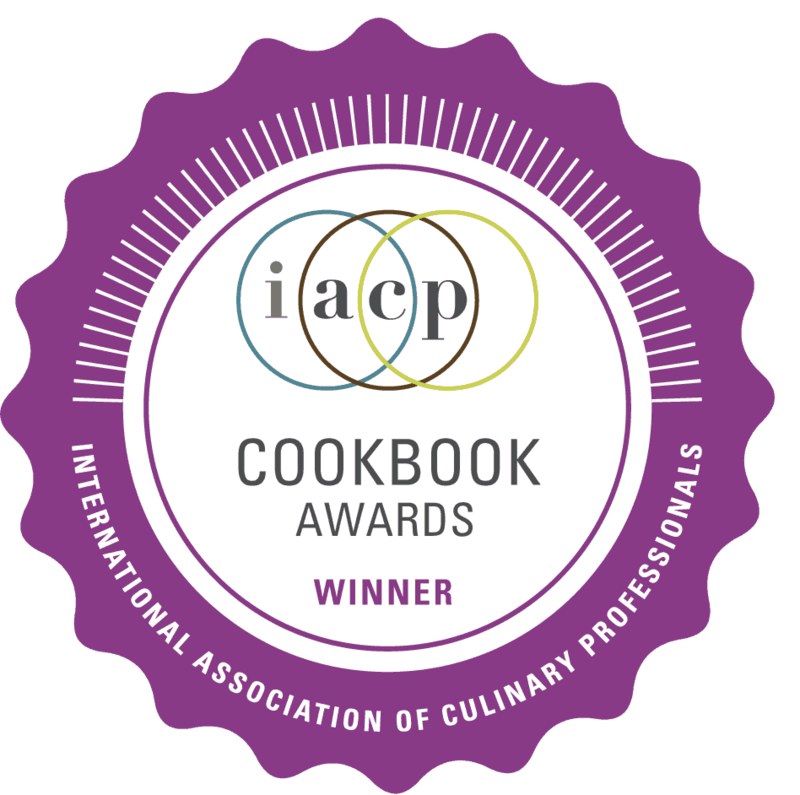 We topped bowls of the warm dessert with Vanilla Buttermilk Ice Cream, which makes a cool and creamy foil to the warm fruit. To make this gluten-free, we first tried 3/4 cup millet flour, 1/4 cup tapioca flour, and 2 tablespoons cornstarch. This combination worked beautifully, but when we added the bourbon, it brought out the bitter notes of the millet and tapioca. We switched to a combination of sweet white rice flour and less millet, with gave the cake a puffy, smooth texture and milder flavor. The one caveat is that the high moisture content reacts with the rice flour to make a slightly sticky/chewy texture. Next time, I’ll try swapping in 1/4 cup sorghum flour for an equal amount of the sweet rice flour, but I wanted to get this recipe posted in time for Labor day festivities, while it is still semi-officially summer. Besides, I won’t be able to get my hands on any Woodleaf Farm peaches before next Tuesday when I journey back to Oakland for my farmer’s market fix. Wishing everyone a happy rest-of-summer, however long it lasts. I used millet and sweet white rice flours here, but I think regular rice flour, sorghum flour, or an all-purpose flour blend would work well, too. 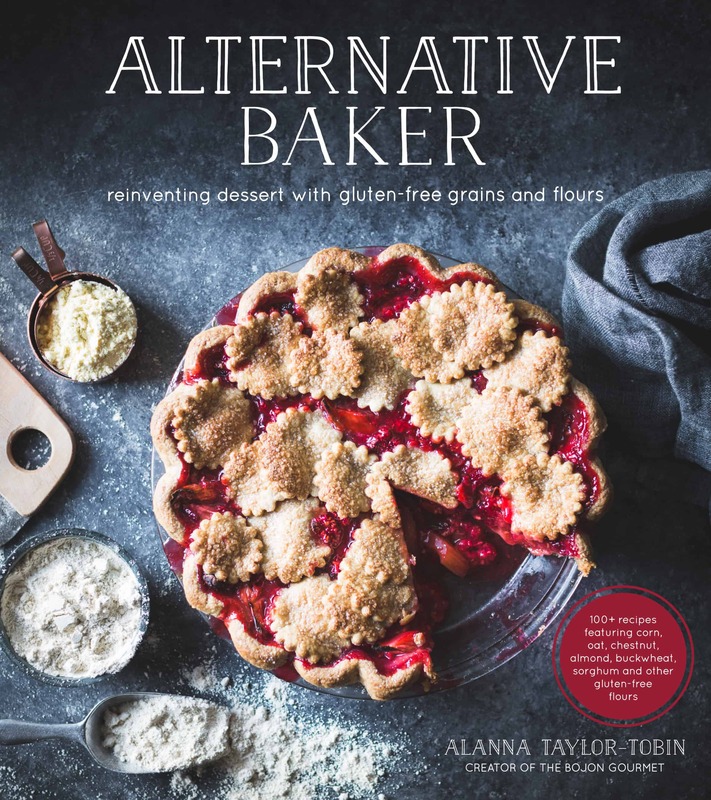 If gluten isn’t an issue for you or your guests, feel free to make this with 1 cup all-purpose flour, omitting the cornstarch and chia. I’m fairly certain that you could use buttermilk in the batter in place of whole milk if you prefer. 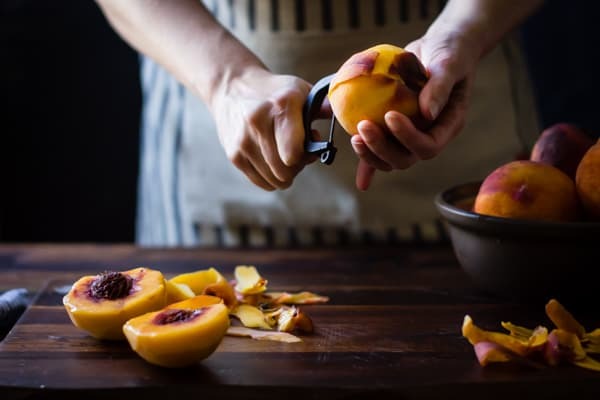 If you don’t have peaches, I think this could be made with apricots, plums, poached pears or quinces, and/or berries instead. 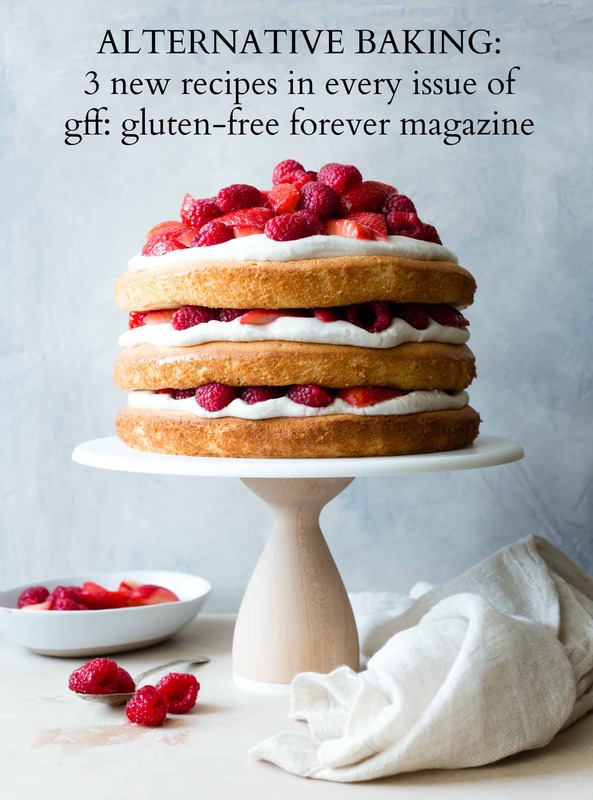 If you are highly sensitive to gluten, seek out a bourbon that is certified gluten-free, such as Maker’s Mark (according to this article from Feed Me Phoebe). Position a rack in the center of the oven and preheat to 350ºF. 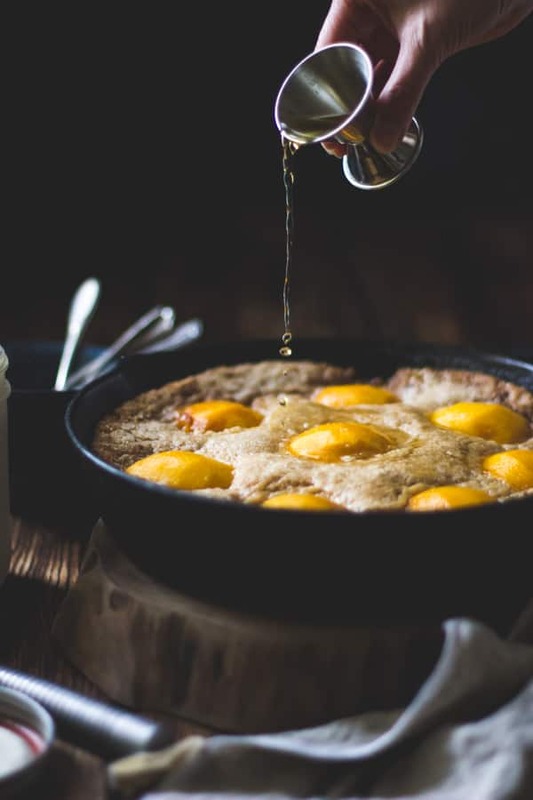 In a 9- or 10-inch oven-proof skillet, melt the butter with the vanilla pod and scrapings over a medium flame. Continue cooking, swirling the pan occasionally, until the butter turns golden with dark flecks and smells nutty, about 5 minutes. Remove the pan from the heat and set aside, removing the vanilla pod once you are ready to add the batter. Meanwhile, stir together the milk with the chia seed and set it aside to thicken. 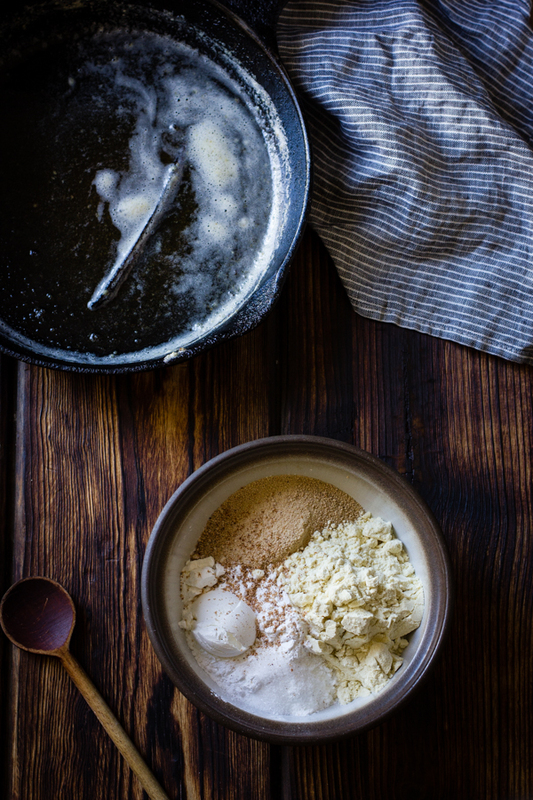 In a large bowl, whisk together the maple sugar, rice flour, millet flour, cornstarch, baking powder, sea salt and nutmeg. Whisk in the milk mixture until the batter is smooth and well-combined. It will be fairly runny. -The edges are puffed and golden and pulling way from the sides of the pan. -The peaches are bubbling furiously. -The cobbler is set with you give it a shuffle. -A toothpick inserted into the batter comes out with moist crumbs. 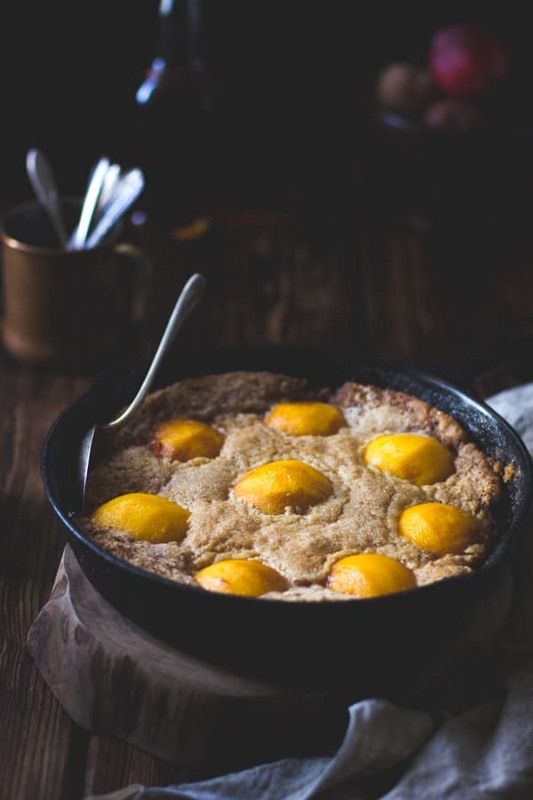 -If you peek inside the batter with the tip of a knife, the cobbler looks fluffy and airy. Oh yes, I forgot about our freakish early-Spring heatwaves counting toward days of summer. :) Thanks so much for the kind words, Eileen! 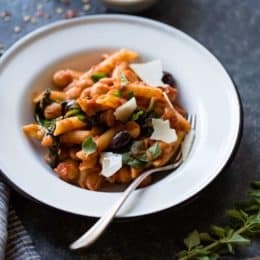 I admit I'm guilty of jumping in to fall food a bit too early, but this recipe reminds me of truly the best days of summer, especially down here in the South. 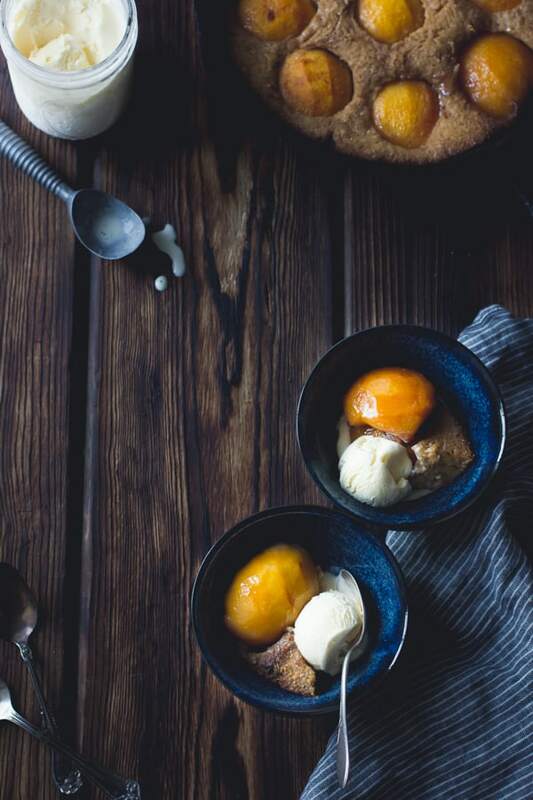 I love the use of whole peaches – a bit rustic, a bit old fashioned, very elegant! Gorgeous photos, of course. I started pinning just one to my Food Photography board and ended up pinning uh…. like, six. Absolutely beautiful pictures! Looks delicious too! 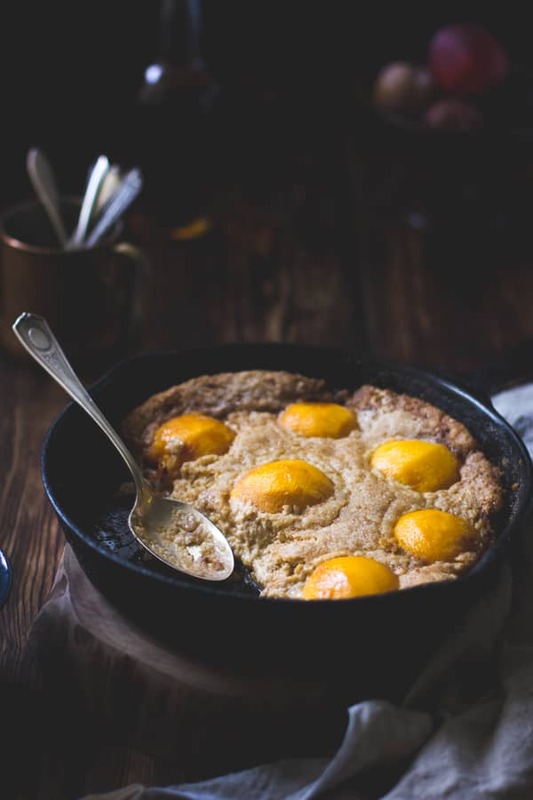 I just picked up Oh Henry peaches at the local stand last week and they are incredible so I know this cobbler tastes as good as it looks! I went to the Ferry Building market yesterday… it was a bit chaotic, but I survived (and managed to carry 5 pounds of apples around with me ;)). Oh, that's awesome – I'm glad to hear you survived! Perhaps I should give that market another chance. Do you live around here? We should meet for a coffee sometime soon! This is such a perfect way to celebrate these dog days of summer (and yes, I'm going to keep calling it summer too!). It's so easy to jump ahead a couple of months rather than living in the moment and this is a good reminder that we've plenty of time until fall/winter kicks in and we should enjoy it! I am all over this. The peaches this year have been amazing. Gotta try this Oh Henry variety. Sounds great. I'm loving the sorghum lately, it is so sweet. So this is all good stuff IMO. By the way I clicked through and watched the SF video, lol!! Ah, I'm glad you liked the video! I've watched it like 5 times. I think "what was that?… Mascara?!" is my favorite bit. I really need to play with sorghum more – such good stuff. Thanks a bunch for the note, lady! This fits right in with your book theme, no??? Summer ain't over til I say it's over (OK, or when Minnesota decides to frost over in mid-September, boooo). Not until I get this amazing looking cobbler in my life, anyway. Boo indeed! Ok, now I feel like a total spoiled California brat for this post. I'm sorry! Know that underneath it all, I'm green with envy at all the lovely pumpkin spiced desserts coming out while I swelter, unable to turn on the oven, all through October. Your pictures are breathtaking! Makes me want to make this right now. 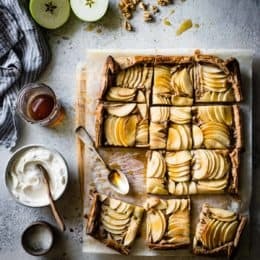 Absolutely lovely photos and flavors! The peaches lately are sooo good. I'm also super intrigued by this style of cobbler… definitely new to me! Thank you Laura! Currently ogling your berry crisp – yum! Beautiful cobbler! And what a fantastic recipe. Thank you Russel – that means a lot coming from the likes of you. Aw, thanks Karen! Please let me know if you ever find yourself in San Francisco and want to get a drink – I would love to meet you! How is this gluten free with bourbon? Are you using sour mash? Hi Kelly, Maker's Mark is a GF bourbon (http://feedmephoebe.com/2013/09/the-6-best-gluten-free-alcohols-hard-liquors/). 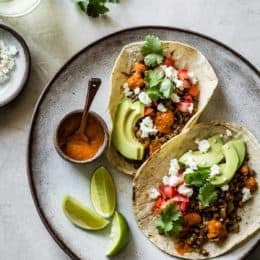 Please see this article for more info on the subject: http://glutenfreesurvivalguide.org/gluten-free-diet-guide/gluten-free-alcohol/. Cheers! be aware that if you have ceiliac disease, bourbon is not gluten free, it contains wheat, barley and rye the three main gluten grains. Alcohol does not 'burn off' in cooking. Do you think this could be made in a larger pan and doubled to serve more people? I think that would probably work. Please let me know how it goes! This is definitely not a cobbler. If anything, it's closer to a buckle or a clafoutis. 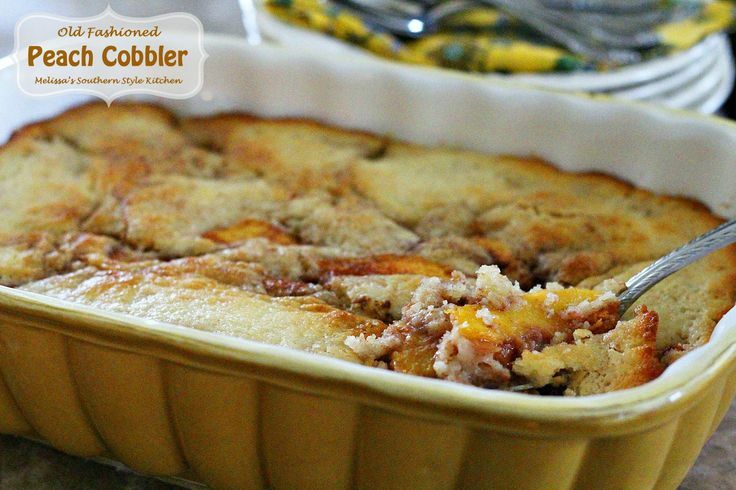 There are no "types" of cobbler, they are all individually specific depending on method. Thanks for chiming in. 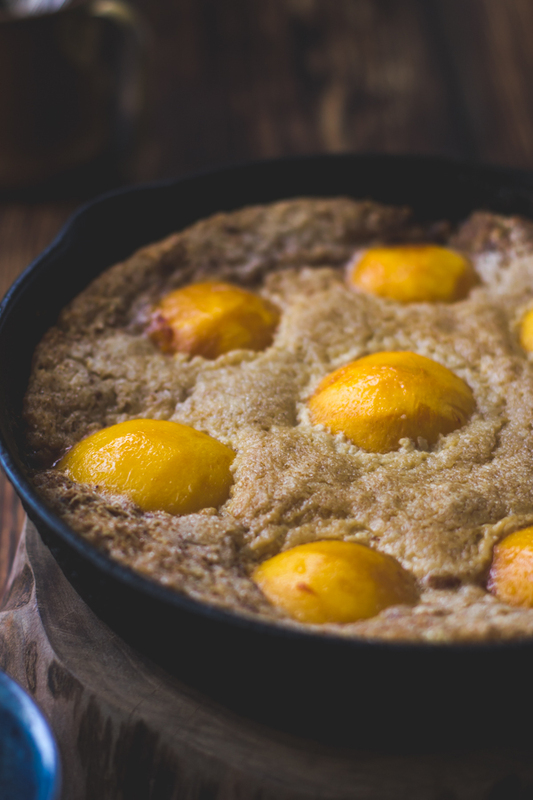 I researched and found this sorta thing called a southern peach cobbler, hence my title of this recipe. Here's an example: https://s-media-cache-ak0.pinimg.com/736x/6e/13/01/6e13016fa9d4ca10549799e1fb838672.jpg Cheers! Holly heck this is delicious!! 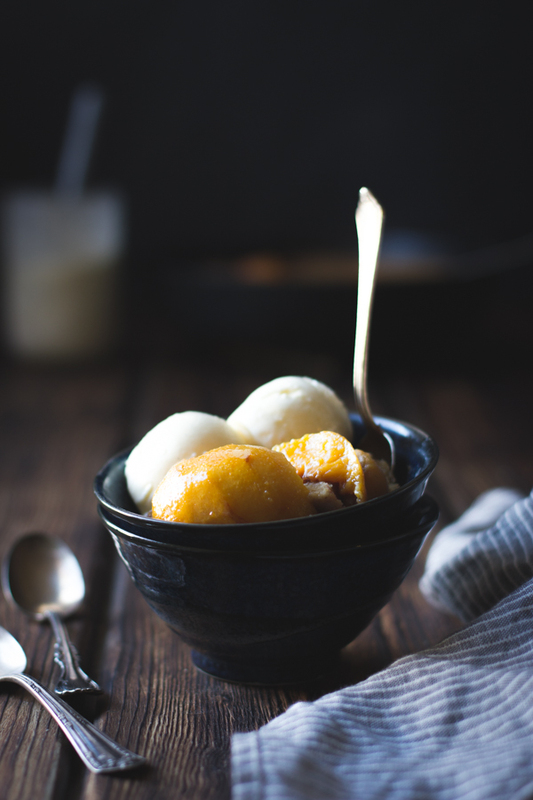 Fluffy, gooey, sweet, and peachy with bits of caramelized sugar along the edge. I used muscavado brown sugar cause that’s all we had and 1/2 cup cashew milk + 1/2 cup cream because we didn’t have milk. I also 5 peaches as I like fruit forward desserts and it was heavenly! Took a good 60 mins to bake, I’m guessing because of the peaches but it was heavenly!!! 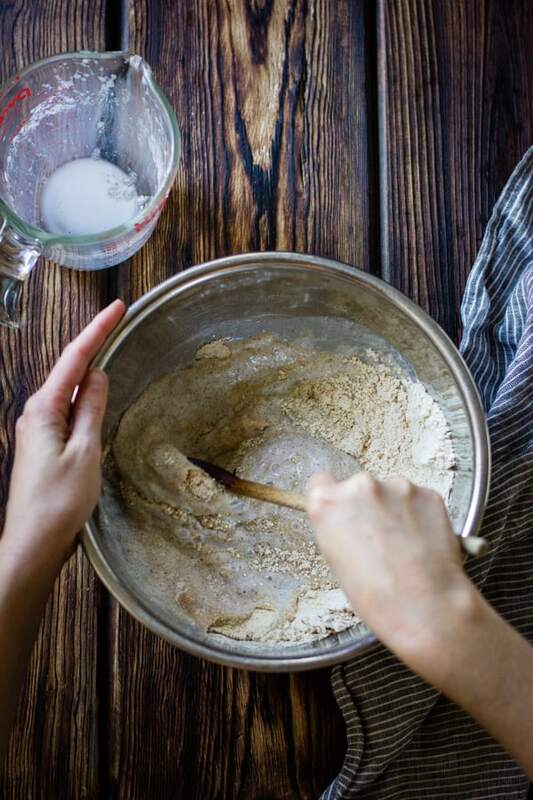 The nutmeg, brown butter, brown sugar and millet flour bring so much flavour to the batter! !